What keeps me from writing…. 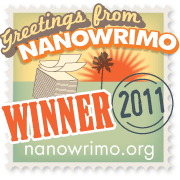 …when it’s not National Novel Writing Month, which I won, by the way! I actually got to over 50,000 words on Tuesday (thank you, Rowdy Girls), and felt miserable yesterday with what I think is a sinus thing as I had a headache for three days. Anyway, I had a brief doctor’s appointment this morning and headed off to the mall to do some Christmas shopping. Oh, I did get about two pages written in the waiting room of the doctor’s office where I found a convenient outlet, so yay!! I got some gifts at the mall and came home by way of our local Target to get wrapping paper and some other gifty/Christmas-y stuff. Tangent – What’s with the Justin Beiber wrapping paper and ornaments???? Seriously??? I get Toy Story, Thomas the Tank Engine, even Sponge Bob. Those are kid things and cute, for the most part. But Beiber??? And there was blue Beiber paper that said Happy Holidays?? I just don’t get it. I don’t get the pink, orange, blue and teal ornaments, either nor the glittery fish ornaments in those colors, but whatever…. Anyway, I went to the checkout and chatted merrily with a wonderfully friendly woman, and it was looking to be a fabulous day. Until I ran my RedCard through. We got an email a while back saying we were late a payment on the RedCard. I didn’t see how that could be as I pay every bill when it comes in, but when I paid bills two weeks ago, I sent in the full amount and thought no more about it until today. I came home, called Target and found out that they haven’t gotten ANY of our payments!!! Six months ago, we had this issue with payments for the RedCard were going to my husband’s old Target Visa card. That was settled easily, and I changed the bill payment record with our online banking to the RedCard number. Turns out I typed an 8 where there should have been a 9. That’s an invalid number and our bank should have been redepositing the payments because Target should have been bouncing the checks, but that hasn’t happened at all. Now it’s only three months worth of payments but it is enough to damage our credit rating. After I talked with a nice Target woman on the phone and went through the online banking screens and discovered that the money was not put back in our account, another woman came on the phone and said she had to talk to Steve. His name is on the card, he’s the primary account holder and he needed to just tell her that he’s aware of all this. I guess we have to find out where the money went – who’s been cashing these checks and get our money back and our account dealt with. That’s why I didn’t come home and dive right back into The Pigsty Princess!